Hey Mom, check out my new motorcycle!!! And if I drive it in Connecticut, then no helmet required! Well, off I go!! Hope I don't get bumped off the road by a tractor-trailer! 600 pounds of engine, covered in 5 pounds of plastic. 0 to 60 in 1.5 seconds. More than anything, I don't appreciate how gallons of highly flammable fuel are nestled inches from your crotch. Of course I'm kidding. You wouldn't catch me dead (or alive) on one of these pocket rocket death traps, especially while the engine is on and/or it's actually moving - even if it does make me look pretty cool. Special thanks to Dennis for allowing me to straddle the thing. Mill - would you sit on the bike again and take your shirt off? I can picture it in my head, but I think the actual photo would be better. #1 Fan, your wish is my command. 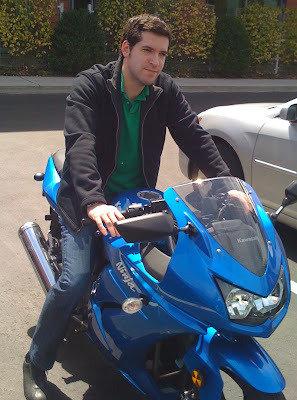 I was able to find another photo - same exact bike, but exactly zero shirts on me. Check it out in my latest post.